Main-floor living on Spacious Homesites. Designed to complement the Timbers neighborhood, this brand-new collection of just 26 homes feel like a favorite mountain getaway, but with a refreshingly contemporary twist. Ranging from 3,111- 3,690 finished square feet with three to six bedrooms, all three new home designs offer the convenience of main-floor living on spacious (up to 1.5-acre) homesites. Here you can enjoy Colorado-casual living and entertaining, thanks to thoughtfully designed spaces that flow from kitchen to dining to outdoor living room. Which, in a setting like the Timbers, just might become your family’s favorite place to be. Spring is coming, are you ready to Plant New Roots? 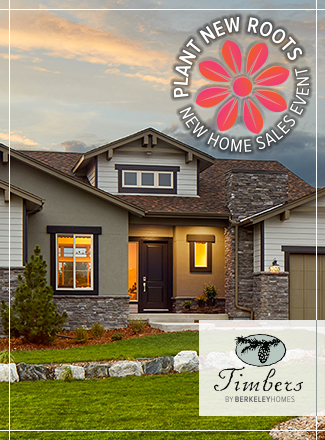 Say hello to your brand-new home during our New Home Sales Event with a $20,000 incentive on 3 select luxury homes at the Timbers. *When contracted by 4/30/19. Can be used toward: price reduction, closing costs, rate buy-down.